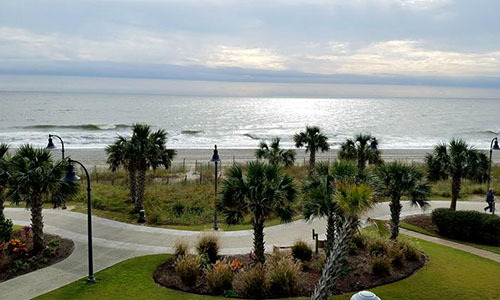 Bay View Resort is located right off the Myrtle Beach Boardwalk offering you 1.2 miles of walking along the Atlantic Ocean. The peace and tranquility of the waves crashing along the shore, is the best way to begin your helath and wellness vacation. On-site fitness center: First, for guests staying at Bay View Resort, our on-property fitness center offers a treadmill, a stationary bike, a universal gym and more – so you don’t have to leave the premises to work up a sweat and get a great workout! Cinzia Spa: Treat yourself to some well-deserved vacation relaxation and pampering at Cinzia Spa, where guests can choose from a long list of massage varieties including Swedish massages, deep-tissue massages, aromatherapy massages or a hybrid of all three. Other mood-boosting options at the 17,000-square-foot well-being oasis include facials, body treatments, manicures and pedicures. Yoga: For those who like to nurture their bodies and souls on the mat, there are plenty of yoga-studio options in the Myrtle Beach area. Among them, The Market Common’s Yoga in Common offers a range of classes geared toward yoga veterans and newcomers alike. Looking to put a truly Grand Strand spin on your yoga session? Jack’s Surf Lessons offers SUP Yoga sessions in conjunction with Yoga in Common – so you can grab a few zen moments while floating atop the local waters on a paddleboard. Bay Naturals: This “healthy market and kitchen” found less than 10 minutes north of The Strand Resort focuses on providing healthful offerings such as raw and organic foods, herbs, nutritional supplements and homeopathic medicines. For grab-and-go prepared meals with an eye toward health and avoiding additives, the organic kitchen is also a great option. To learn more, visit baynaturals.com. Kindbelly Café: Found on 79th Avenue North in Myrtle Beach, Kindbelly strives to offer a healthy alternative to the typical breakfast and lunch eatery options. The fresh, nourishing and wholesome dishes found on the menu here include soups, salads, bowls, omelets, acai and pitaya blends, smoothies, and more, all featuring organic, non-GMO and responsibly sourced ingredients. Check out the restaurant’s full range of healthy offerings at kindbellycafe.com. Bike rental: See the Grand Strand sights by pedal power – and get some exercise while you’re at it! Found less than 2 miles south of Bay View Resort, on Broadway Street in Myrtle Beach, Beach Bike Shop offers cruiser, hybrid and road bike rentals by the day or week, and they’ll even deliver (for an added fee) when guests rent their bikes for three days or longer. We hope all of these options will allow you to really relax and unwind and as you head back to work, smile and remeber all of the fun!